A Caesarian, or C section, is the medical term for the intervention of childbirth where the baby is cut and removed from the womb of the mother by doctors. 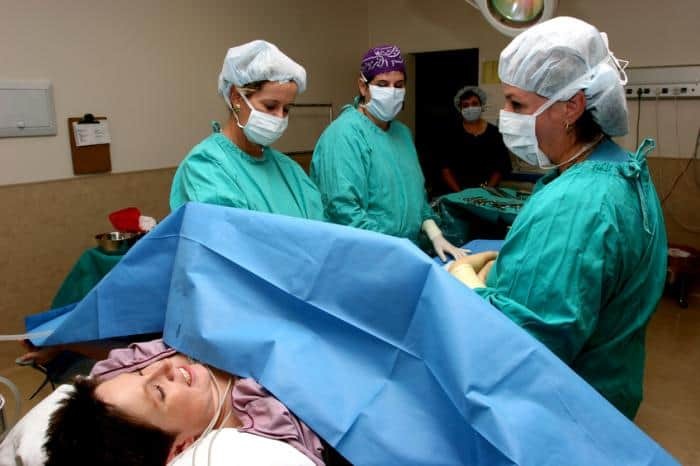 It is believed that there is only one known case of a woman giving herself a caesarian section without a doctor, where both the mother and child survived. On March 5, 2000, in Mexico, Inés Ramírez performed a Caesarean section on herself and survived, as did her son, Orlando Ruiz Ramírez. She was tended to shortly afterwards by a nurse and was taken to hospital. It is rumoured that Caesarian Sections got their name from the infamous Roman Ruler Gaius Julius Caesar. Caesar left an enormous legacy on the world we know today, influencing the world we live in and the way in which we speak. Julius Caesar has been flouted for centuries as the first to be born in this way, by cutting open the mother to remove the child, therefore the process was called a ‘Caesarian’. This is in fact a myth. Caesar was not born by Caesarian section. This text states that Caesarians are not named after Caesar but instead Caesar was named after Caesarians. In Latin caesus is the past participle of caedere meaning “to cut”. But it gets more complicated than that because Julius Caesar wasn’t even born from a caesarian section. Not only did were they not named after him, he never even had one. The practice of cutting a baby from it’s mother was actually part of the law when Julius Caesar was born however it was only ever preformed after the mother had died. Known as the Lex Caesaria, the law was established in the time of Numa Pompilius 715-673 BC, hundreds of years before Julius Caesar was born, stating that if a pregnant woman died, the baby had to be taken from her womb. Britannica online states that the law was followed initially to comply with Roman ritual and religious custom which forbade the burial of pregnant women. Religious practice at the time was very clear that a mother could not be properly buried while she was still pregnant. As knowledge and hygiene improved the procedure was later pursued specifically in an attempt to save the child’s life. As a testament to the fact that women did not survive caesarians, the Lex Caesaria required the living mother to be in her tenth month or 40 -44th week of pregnancy before the procedure was performed, reflecting the knowledge that she could not survive the delivery. The Ancient Roman caesarean section was first performed to remove a baby from the womb of a mother who died during childbirth. Caesar’s mother, Aurelia, lived through childbirth and successfully gave birth to her son. Julius Caesars mother was alive and well during his life. A common misperception holds that Julius Casear himself was born in this fashion. However, since Caesar’s mother, Aurelia, is believed to have been alive when he was a grown man, it is widely held that he could not have been born in this way. It was Pliny the Elder, born 67 years after Caesars death, who theorised that Julius Caesar’s name came from an ancestor who was born by Caesarean section, and that his mother was following the family tree when naming her child. It is unknown why Julius Caesar was named after the latin word meaning ‘to cut.’ Perhaps we will never know. There were a number of Roman rulers who were entitled “Caesar”. Augustus Caesar was in power when Jesus was born, and there was also one named Tiberius Caesar. There were others as well….did not take time to check the history books. There is a difference between “cesar” (to cut) and “Caesar” as the title for a Roman emperor.